Set during the Civil War, against a backdrop of grand estates, unimaginable riches, and deadly secrets, three teenagers in Mystic Falls, Virginia, enter a torrid love triangle that will span eternity. Brothers Stefan and Damon Salvatore are inseparable, until they meet Katherine, a stunning, mysterious woman who turns their world upside down. Siblings turned rivals, the Salvatores compete for Katherine's affection, only to discover that her sumptuous silk dresses and glittering gems hide a terrible secret: Katherine is a vampire. And she is intent on turning them into vampires so they can live together - forever. I really enjoyed this story. Never liked Vampire movies but really really liked this story. 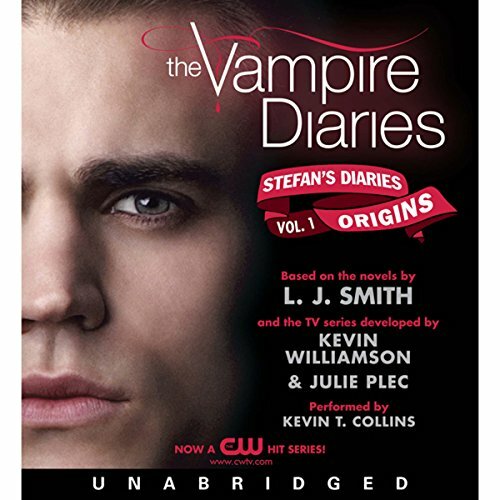 What did you like best about The Vampire Diaries: Stefan's Diaries #1: Origins? What did you like least? I wish I had known that this was based on the TV series. I love the TV series, don't get me wrong, but that's not what I was looking for. I was looking for more books by L.J. Smith in the Vampire Diaries series. I kinda feel deceived by Audible for listing them as L.J. Smith. This is a nice listening for everyone who loves the tv show, not the novels. L. J. Smith's work is always very good: there are interesting characters and situations, descriptions are apt without being overwhelming, and the pacing is the right one for a vampire story. The narration though is not a great one: the performer is almost always using the same tone, his portrayal of female characters is sometimes comical (Stefan's fiancee for instance) and overall he doesn't create the same sense of foreboding and despair that Rebecca Mozo provides in her performance of the main novels. It's OK if you love the tv show, but for the original series reader it's rather disappointing (though not seriously so). These were a little boring to me bc I had read the other books before I read this series. I absolutely. Love he story line how its during a very historic period I love he way they speak to one another and the romance. The main problem I had wig my audible book is the narratives voice himself he just didn't speak the words without the correct tone of voice! What was one of the most memorable moments of The Vampire Diaries: Stefan's Diaries #1: Origins? Could you see The Vampire Diaries: Stefan's Diaries #1: Origins being made into a movie or a TV series? Who should the stars be? People. Who haven't gone through the first books yet. I'll try Stephan's diaries part 2. The accents changed the character. He went from suave Italian. To a country boy. Very confusing to me. If you could play editor, what scene or scenes would you have cut from The Vampire Diaries: Stefan's Diaries #1? The scene where he learns his father shot him and Damon. Story line was changed, chapters accents were changed. Hard to get into this book. I think it was a good book,haven't finish listening to it yet and I'm really eager to finish listening and move on to the other book in the series. So, I was nearly finished with this book when I started to get a bit confused. The events in this book are different from what we were told in the first Vampire Diaries book. Only to realize that this book is based off the TV series and not (as I thought) the book. It was still good though. And if you're a fan of the TV series then definitely check it out. I'm not sorry I read it, just confused. Enjoy. Also, Kevin T. Collins is a great narrator. Die Bücher - obwohl auch von L. J. Smith geschrieben - basieren diesmal auf der Serie nicht auf ihrer ursprünglichen Geschichte. Das, was bereits aus der Serie bekannt ist, wie Stefan und Damon zu Vampiren wurden, wird hier noch einmal ausführlich aus Stefans Sicht geschildert.